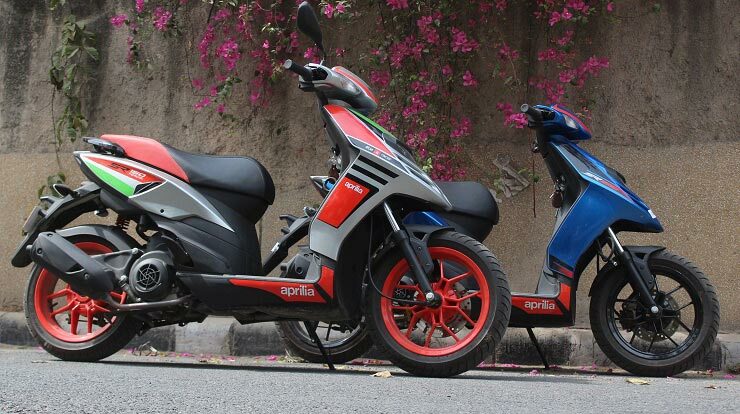 Aprilia recently launched the SR automatic scooter with a smaller engine and an affordable price tag. It is called the SR 125 and as the name suggests, comes with a smaller 125cc engine that is sourced from the Vespa 125. Both the SR 125 and its elder sibling, the SR 150 look identical but have quite a few differences between them. So which one should you buy and why? 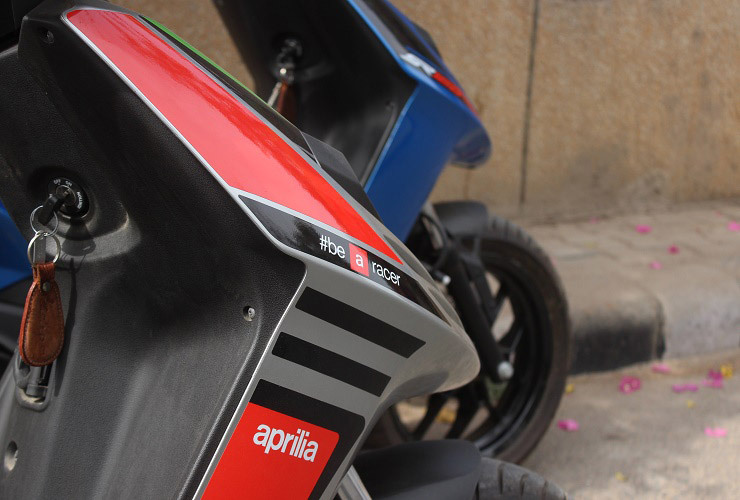 I picked the SR 125 from Delight Motors, Delhi and rode my own SR 150 Race for this quick comparo. 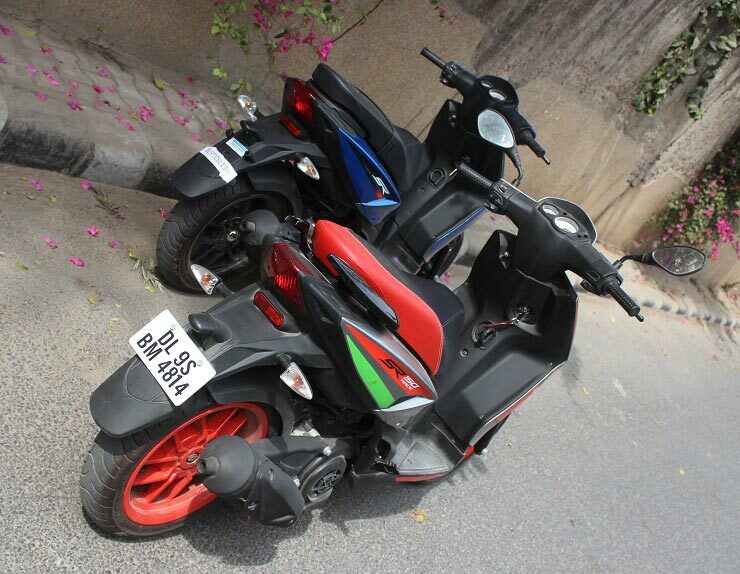 Both the scooters share the same body work which makes them two of the best looking scooters in India. The difference here is the color combination and the sticker work which sets them apart. Also, the SR 150 is available in an option Race Edition which makes it look even better thanks to the sporty sticker work. A bit loud in our opinion but helps turn heads. If you want to garner attention, get the SR 150 Race edition. Both the SR 125 and SR 150 are identical in this regard, well almost. And this is one of the shortcomings. 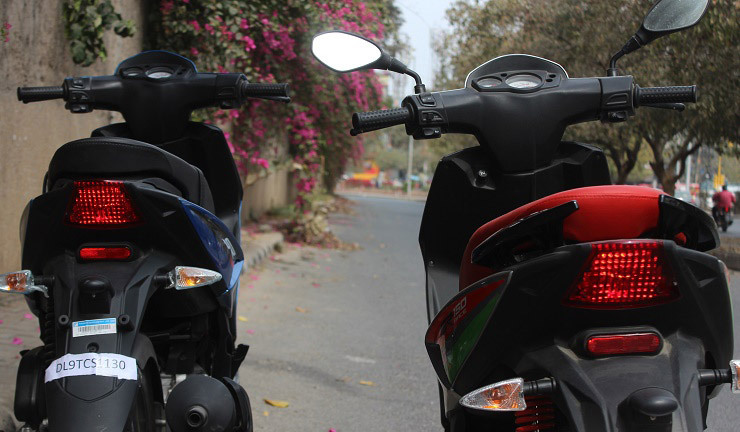 Both the scooters lack a digital display for the speedometer (Grazia and NTorq are superior in this regard), do not offer engine kill switch, front storage, under-seat light, USD charging facility or an external fuel filling. The under-seat storage space is also limited. The SR 125 further does away with pillion grab rails and gets a single tone finish for the seat as compared to dual tone on the bigger SR 150. So if you want features, the SR 150 is the clear winner. This has been one of the strongest points about the SR 150. It rides unlike other scooters and feels a lot like a motorcycle and the smaller SR 125 carries the same trait. The bigger 14-inch wheels with wide 120mm tyres along with a chassis-suspension set-up that is geared towards better handling make the SR twins the best in their segment in this department. High speed manners are excellent too and ditto for braking abilities from high speed. The SR 125 is lighter than the 150 and this gives it an edge in slow moving traffic. The SR 150 is India’s quickest scooter and the Race edition improves on that. The new SR 125 uses a smaller engine with approximately 8% less power and 13% less torque. Performance, as expected is not as peppy as the SR 150 but is good by 125cc standards. The SR 125 however is a better buy for first time scooter riders who could get intimated by the 150’s throttle response and eagerness to gain acceleration. For numbers, the SR 150 puts out 10.4 bhp of power and 11.4 Nm of torque. The SR 125 on the other hands put out 9.5 bhp of power and 9.6 Nm of torque. If you want grinning moments, pick the SR 150. If you want something less surprising, the SR 125 fits the bill, specially with its better fuel economy. The SR 125 is priced at Rs 65,300 (ex-Delhi) making it about Rs 4,800 cheaper than the SR 150 in terms on-road cost. Both the scooters also have PayTM offers with the 125 getting an additional Rs 500 cash-back. This pushes the cost difference to Rs 5,300. This makes the SR 150 approximately 7% more expensive. If you plan to purchase these on EMIs, the monthly difference will amount to Rs 240 and Rs 160 for two and three years respectively. This is a small amount given the extra performance on tap, something that comes handy while riding with a pillion. 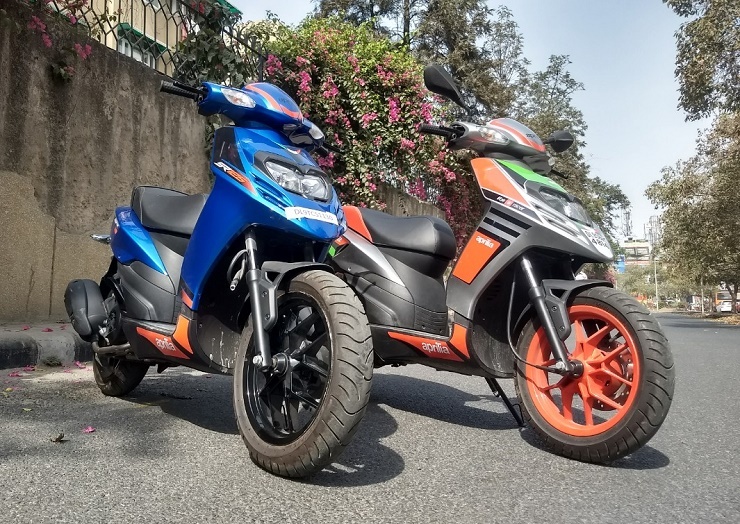 As we said, if you are a first time scooter buyer, the SR 125 will keep you happy with a good balance of performance and fuel economy. However if you want India’s best fun-to-ride scooter, the SR 150, at a small premium, is a worthy purchase.